One of the Big Data Extension strengths is the flexibility to provision Hadoop clusters based on the distributions that best suites your taste. 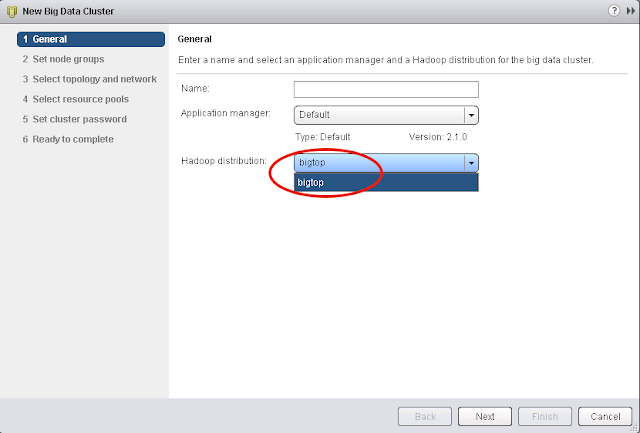 Although BDE comes only with Bigtop distribution, it’s very easy to add the new ones you need. To add a new distro just use the /opt/serengeti/sbin/config-distro.rb command. BDE Administration Guide cover it nicely, so there’s no point to duplicate the details here, just take a look at the guide for the right syntax and I'm sure you will be good to go. In fact what I want to cover here is how to remove a distro from BDE !!! You might have realized already that using config-distro commando to add a distro is pretty straightforward, but removing it is not that intuitive. Let's see how to accomplish it then ! As you can see, I have added Hortonworks (HDP-2.2) to my environment. When you add a distro, it's details are published to a manifest file for later consumption. To remove it, login on BDE and edit the manifest file to remove the distro information from it. Don’t forget to create a backup file first. Now we are ready to edit it. Save the file and restart BDE services to the changes take effect. 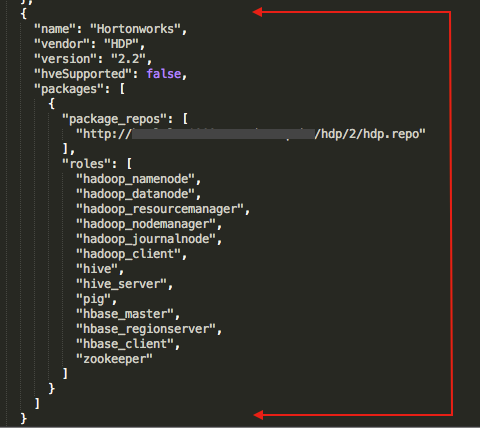 As you can see the Hortonworks is no longer available. If anything goes wrong just restore the backup file and restart tomcat service again. Now you are ready to manage the distributions on your BDE solution !!! Essential role of the VMware Big Data Extension is the node provisioning automation function, which uses a virtual machine belonging to BDE’s vApp as template for new Hadoop cluster nodes. It’s not unusual that companies need to change their template’s configuration to adhere to internal security requirements, installing agents like for monitoring and antivirus or tweaking some security parameter, which will all be inherited by the new nodes. The template provided by VMware as part BDE 2.2 is a CentOS 6.5 64-bits, so if you want to change anything on it first you would need login on (obviously). The thing is you can look for it's username and password through all the documentation and you wont find it. Since it took me some time to find it, I thought it would be a good idea to share with you guys. You can leverage sudo if you need to run any command with a higher privileges. One last reminder, after your change is completed, don’t forget to remove all configs from /etc/sysconfig/network-scripts/ifcfg-eth (otherwise the new nodes wont get the correct IP) and delete the VM’s snapshot. If you got this far and still have doubts about what BDE is really about, check my BDE The basics post.